Season Preview – The young players for the Wizards finally started coming into their own last season. John Wall became an All-Star for the first time, and Bradley Beal showed signs of being one of the best 2-guards in the league. In addition, the acquisitions of Nene and Marcin Gortat have given this team an inside/outside balance that is one of the better ones in the league. The loss of Trevor Ariza may show itself more on the defensive end, but Pierce should be an adequate stop-gap as the Wizards wait on the development of Otto Porter. The only trip up I see with this team is perimeter depth. If Wall or Beal go down for any extended amount of time, this team could be in trouble. 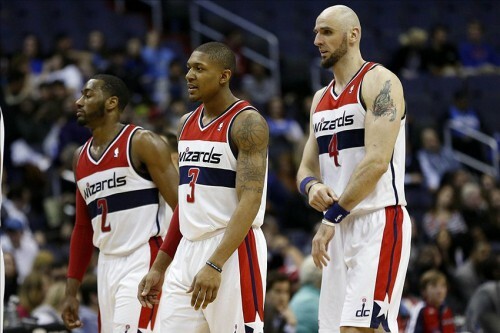 2014-15 will be successful if: The Wizards make it to the Eastern Conference Finals. 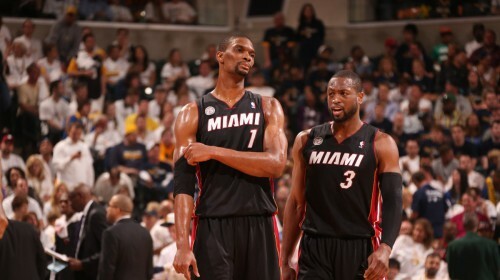 Season ended: Game 4 of the first round of the Eastern Conference playoffs against the Miami Heat. 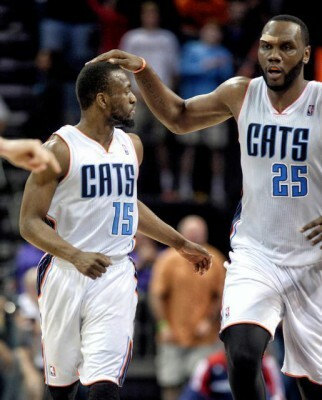 Season Preview – The Hornets (formerly the Bobcats) come into this season with as high of expectations as they’ve ever had in their 10 year reincarnation. Michael Jordan and GM Rich Cho have slowly put together a balanced team that is built on defense. The key now will be developing the young talent they’ve obtained over the past 2 seasons, while also learning how to consistently win. Al Jefferson provides the Hornets with a go-to scorer, while Stephenson and Michael Kidd-Gilchrist will be nightmares on the defensive end for opposing wings. If the Hornets can find consistent scoring from the perimeter, they may be a surprise team in the East. 2014-15 will be successful if: The Hornets make it to the 2nd round of the playoffs. Season preview – It was a good run, boys. The four year “Big 3” experiment yielded four consecutive trips to the Finals and two championships. “Not 1, not 2…” wait, yeah, only 2. LeBron James returning back to Cleveland has brought the Heat back down a notch or two on the NBA spectrum. While Dwayne Wade and Chris Bosh are still in tow, the engine that made the team run is no longer there. The team that we’ve seen for the past four years will be completely different. No longer will the threat of a driving James cause defenses to collapse into the paint, leaving a plethora of wide open shooters. 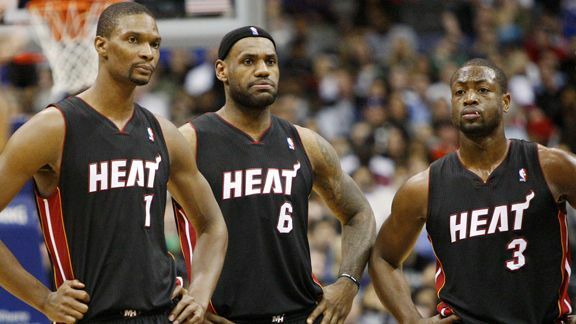 Instead, Miami will likely run its offense inside/out through Bosh. Gone are the shooters that provided that floor spacing for James and Wade to operate. And the lingering concern over Wade’s health still remains. The Heat will still win games, but there will be a significant drop-off from the previous four seasons. Season preview – If there is a team in the league that wants the season to start already, it is the Atlanta Hawks. The offseason can be a cruel time for a team that is embroiled in controversy. The Bruce Levenson/Danny Ferry race fiasco is a situation that probably won’t be completely resolved until next season. On the court, Atlanta is one of those teams that’s always good enough to win more games than it should, but loses out on getting a good draft pick because of that. Al Horford returns after missing most of last season with a torn right pectoral muscle. Their front line of Horford, Pero Antic, and Paul Millsap will be one of the more dynamic front courts in the league. The addition of Sefolosha will help shore up the perimeter defensively, but will provide little from an offensive standpoint. 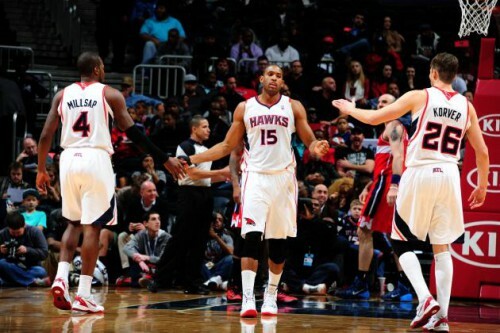 2014-15 will be successful if: The Hawks make it to the 2nd round of the playoffs. Season preview – The Magic are at the point in their rebuild where they need to decide on what to do with some of their young guys. Nikola Vucevic and Tobias Harris will be coming up on restricted free agency next offseason, with Andrew Nicholson, Maurice Harkless, and Fournier coming up with offseason after that. The Magic will probably be a big player at the trade deadline as they need to start moving some of their young pieces for either a big name player or assets. On the court, the Magic will continue to be an uptempo transition team, especially with Payton manning the point. Victor Oladipo will need to show improvement on his jump-shot, but Ben Gordon and Frye will provide some of the spacing Oladipo needs to operate. I see the Magic slightly improving, but still struggling to consistently win. 2014-15 will be successful if: The young guys continue to develop and the Magic end up with a Top 7 pick. First game out of the shoot after the All-Star break, and we get a prime time match up against our ultimate rivals, the Miami Heat. The story lines heading into this game are a plenty. The first story line is whether Russell Westbrook will return after missing the last 8 weeks due to arthroscopic knee surgery. As of Thursday morning, he was still a game time decision. If Westbrook does return, how will his presence affect the Thunder’s play after they adjusted so well to life without him. Another story line at play is the MVP debate. Kevin Durant was the favorite for the award heading into the All-Star break, but LeBron James decided to launch a “look at me” media campaign and has, once again, entered the narrative for the MVP award. The Thunder won the only other meeting of the season between these two teams. After falling behind by 18 six minutes into the first quarter, the Thunder went on to outscore the Heat 108-73 the rest of the way. The game was never in doubt for much of the 4th quarter. 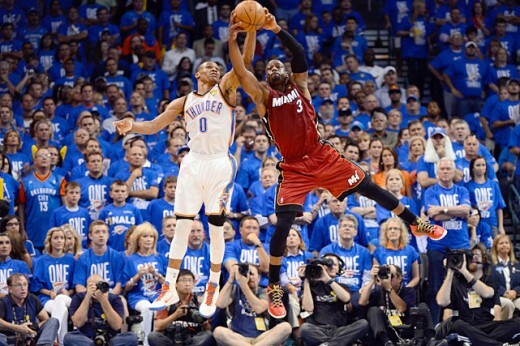 It was the Thunder’s first victory in the last 7 tries against the Heat, which included Games 2-5 in the 2012 NBA Finals. But, in the end, that victory was just that: a regular season victory. In the grand scheme of things, when all the numbers are put together, that win in Miami will just be one of the many wins for the Thunder in the regular season. 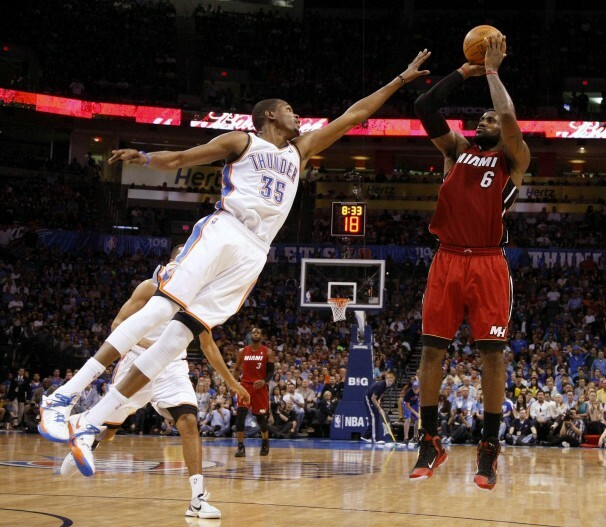 Plus, we all know what happened the last time the Thunder won a game against Miami. The Heat are currently 38-14, which puts them 2 games behind the Indiana Pacers for the top spot in the Eastern Conference. It was during this time last season that the Heat were in the midst of one of the greatest runs in NBA history, winning 37 of their last 39 games, which included 26 in a row. 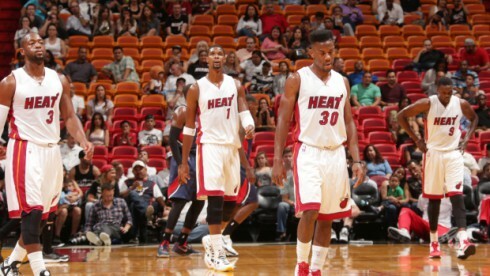 The Heat seem to be raring to put together a similar run to close out this season. They are 11-3 in their last 14 games, and seem to have found some motivation in the successes (threats?) of the Thunder and the Pacers. 1. A Motivated LeBron James – It seems that the Heat may have been pulling a bit of a rope-a-dope in the first half of the season. 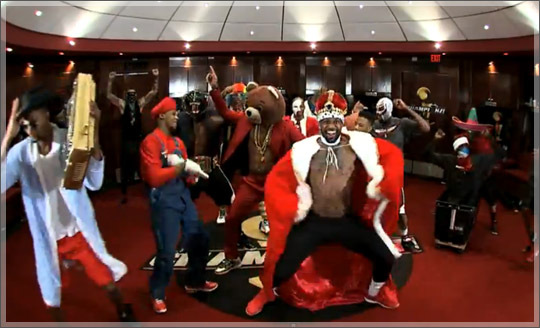 They rested Dwayne Wade for some games, their role players looked old, and LeBron wasn’t his usual magnificent self. But it appears that they were biding their time for the 2nd half of the season and for the Second Season. All the MVP talk that filled the air in late January/early February was all directed towards Durant. And I think, for the first time in a while, James felt a little bit threatened/disrespected. The greatest usually use the slights as motivation, so it’ll be interesting to see what James does in the game in Oklahoma City. 2. 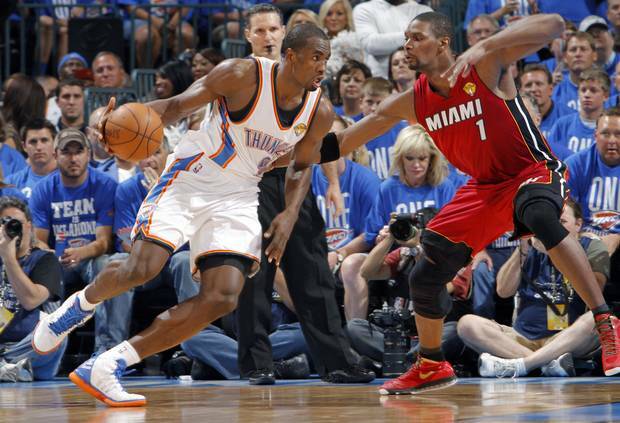 Third Wheels – The key to this match-up has been the 3rd wheels (Chris Bosh and Serge Ibaka). After years of inconsistency on the offensive end, Ibaka seems to finally be comfortable in his role as the 3rd option/release valve for both Durant and Westbrook. His 22 points, 8 rebounds effort was part of the reason the Thunder were able to weather the storm early in the first game and finally take over in the second half. 3. 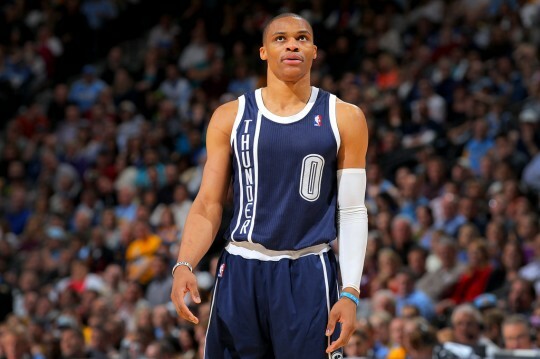 Russ – Will he be back or not? If he is, how will he assimilate to the team? More importantly, how will the team assimilate to him? It’ll be interesting to see how the team (and the team’s psyche) adjusts if Westbrook is indeed playing. Forty one down, forty one more to go. 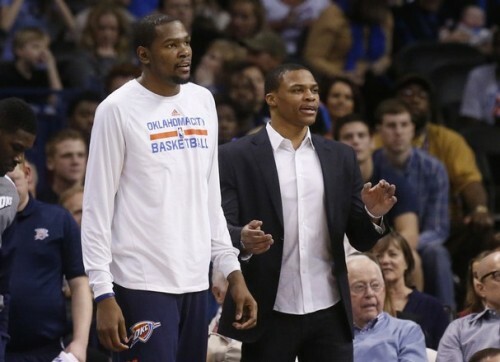 The first half of the season for the Oklahoma City Thunder has played out like a full season. From injuries, to returns, to reinjuries, to MVP pushes, it has been a roll coaster of emotion that has run the gamut. Through it all, the Thunder have found a way to win 31 games and remain near the top of the Western Conference standings. 10. The Western Conference is head and shoulders above the Eastern Conference in terms of competitiveness. The Western Conference features 10 teams at .500 or above, while the Eastern Conference, until recently, only had 3 teams with that same win percentage range. Within the past week, three teams have joined the fray in the Eastern Conference with records of 20-20. The fact still remains, though: there’s an ocean sized gulf in the competitive balance between the two conferences. While Indiana and Miami are the crème de la crème of the EC, the West has at least 6 suitors for the top spot. I have no doubt the Eastern Conference Finals between the Miami Heat and the Indiana Pacers will be a great 7-game affair. But the amount of work that both of those teams have to put in to get to that point will pale in comparison to the battles that will be waged in every single round of the Western Conference playoffs. While that makes for a battle tested representative from the West, it also makes for a tired or injured representative that has survived a war of attrition. Something to watch for as we move on. 9. 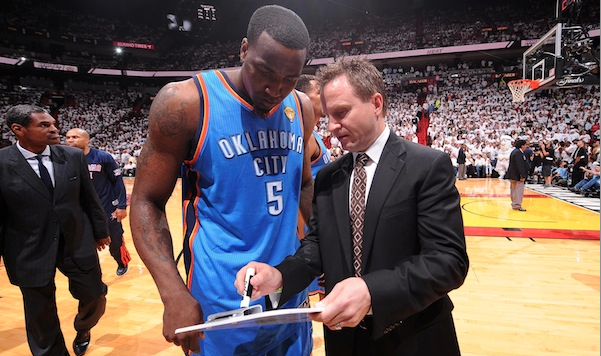 Scott Brooks needs to be considered for Coach of the Year. Coach of the Year is usually given to the coach whose team unexpectedly excels despite what the prognosticators predicted in the preseason. If that is the case, then this award will come down to a battle between Jeff Hornacek of the Phoenix Suns or Terry Stotts of the Portland Trailblazers. When Phil Jackson and Gregg Popovich have only combined for 3 COY awards between them, you know this is a fresh-face award. And that does not bode well for Brooks’ candidacy. But consider this, the Thunder are tied for the 3rd best record in the league, while missing a top-10 player for about half the season so far. When Russell Westbrook was in the line-up, the Thunder had the best record in the league during that stretch. And the Thunder have had to incorporate new young players into the rotation that did not garner heavy minutes last season. The balance and willingness to adapt that Brooks has shown throughout the season makes this his best coaching job to date, and one that I think garners consideration for COY. 8. Serge Ibaka has been the glue that has held this team together. Through all the changes that have occurred this season, the only constant has been Serge Ibaka. From Westbrook to Reggie Jackson to the young bench’s emergence to Kevin Durant’s dominance, the one factor that usually determines a Thunder victory is how well Ibaka plays. In games in which he has a double double, the Thunder are 14-3. In games where Ibaka scores 16 or more, the Thunder are 16-2. It’s as simple as this: if Ibaka plays well, the Thunder usually win. And he’s been playing a lot more consistently this season. He’s gotten smarter defensively and is concentrating more on positioning than on chasing every shots that comes into the lane. His play has been solid enough this season to garner a real look at him making the All-Star game. 7. Kendrick Perkins currently has more value to this team than Thabo Sefolosha. For all the chastising that Kendrick Perkins receives from fans and media members alike, he still has value on this team. Is he probably the worst offensive center in the league (starting or not)? Yes. What takes longer to get off the ground: Kendrick Perkins or an 18 wheeler using a manual jack? Probably Perk. But the experience Perkins has as a post defender is invaluable when the opponent has a player like Dwight Howard, Tim Duncan, or LaMarcus Aldridge. His knowledge of defensive principles in the post also helps the Thunder out. And, well, he’s a hell of a screen setter. Is he worth $8.7 million (and over $9 million next season)? Of course not, but from team hierarchy perspective, Perkins is the guard dog that patrols the Thunder’s house, on and off the court. Thabo Sefolosha is the team’s main perimeter defender and the anointed “corner 3” guy. Over the past two seasons, that role has worked out great for Sefolosha. He shot over 40% from 3-point territory and was, without question, the best perimeter defender on the team. This season though, his 3-point shooting percentage is down to 31% and his role as a one-on-one defender has started to decline. Also, the drafting of Andre Roberson and the emergence of Jeremy Lamb have given the Thunder options if Sefolosha leaves via free agency this offseason. 6. 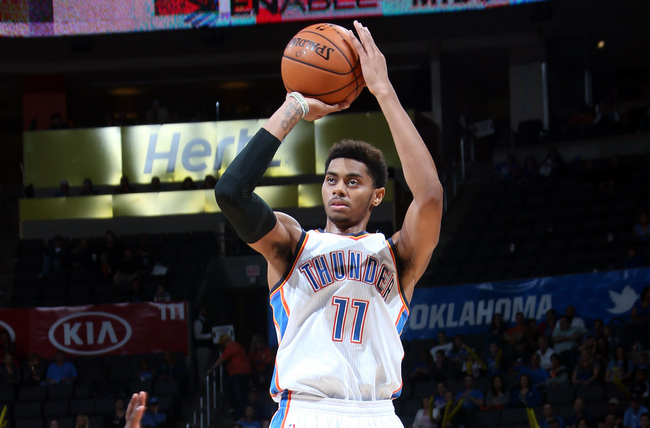 The team made the right choice in sticking with Jeremy Lamb. 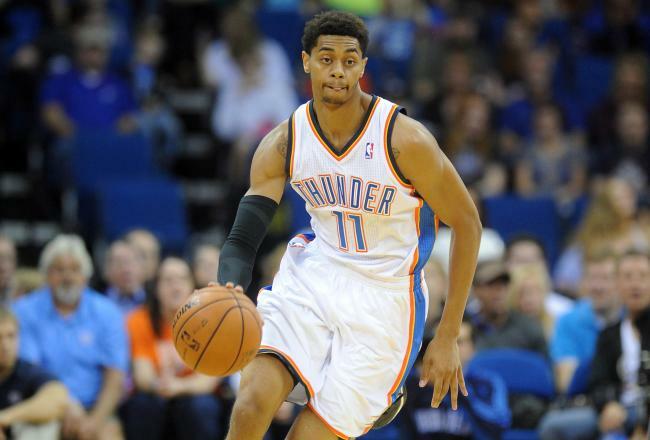 Heading into the last offseason, the Thunder’s biggest trade asset was guard Jeremy Lamb. Along with the No. 12 pick, the Thunder could have packaged their young asset to move up in the draft. Instead they kept their pick and chose to stay with Lamb. It has proven to be a wise choice. Lamb has provided valuable perimeter shooting to a team severely lacking it, and has been a great glue guy, providing whatever needs to be provided to win. 5. Steven Adams was made to play for this team. When the Thunder drafted Adams, I envisioned a year full of trips down I-44 between Oklahoma City and Tulsa for the big man. Instead, Adams is probably in the second tier of rookies vying for Rookie of the Year. He brute physicality and footwork have helped him adjust to the pro game a lot quicker than most expected. He has shown flashes of an offensive game (hook shots, a developing mid-range jumper) and leads the league in PEFG (players ejected from game). He is developing in this teams’ version of Bill Laimbeer or Dennis Rodman. A guy that who raises the ire of other players, but who also remains as cool as the other side of the pillow. He starting to develop a reputation around the league as a dirty player, but, really, he just plays strong. And this generation of player does not like getting physical. 4. 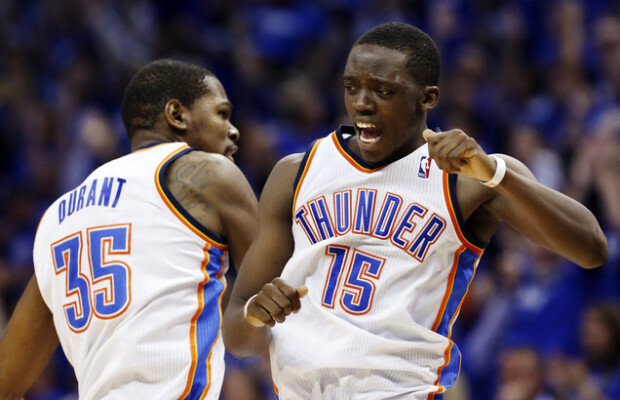 When completely healthy, the Thunder are the deepest team in the league. The Thunder are constructed to have a little bit of everything. If you need big men, the Thunder can trot out 4 or 5 that get regular minutes. 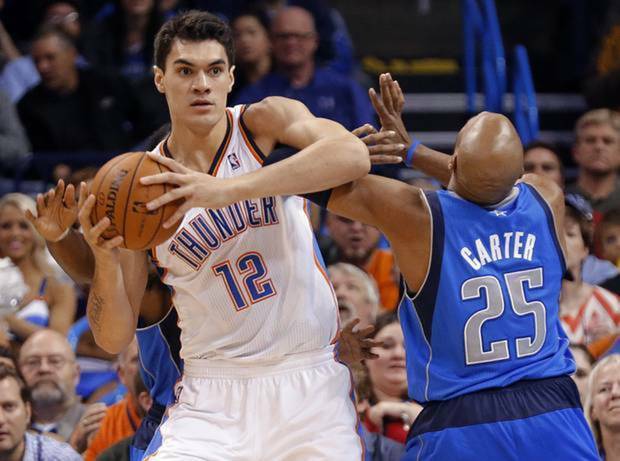 If you need veteran savvy, the Thunder can give you Nick Collison or Derek Fisher regularly. If you need scoring off the bench, I present to you Reggie Jackson and Jeremy Lamb. If you need a jack of all trades, here’s Perry Jones. And that’s without even getting into Durant, Ibaka, and Westbrook. The Thunder are loaded when the entire team is available. When the starters sit, the bench has the ability to either chip away at deficits or blow the game wide open. If you want small ball, the team can put out 2 or 3 different combinations that are all very effective. The point of the James Harden trade was to not only have financial flexibility, but also roster flexibility. Instead of having just one combo guard off the bench, you now have a combo guard, a shooting guard, and a developing big man. More parts for less money is always a win in any business. 3. Point guard is the hardest position to learn in basketball. Combo guards sometimes have the most difficult job in basketball. A pure point guard has to worry about distributing first, then scoring. But a combo guard has to read the situation and determine whether he should pass or shoot. Sounds like the same situation, but there are two totally different mentalities involved. We saw that with Russell Westbrook, who had all the tools to be a combo guard, but had to neuter that a bit to learn how to be a starting point guard in this league. 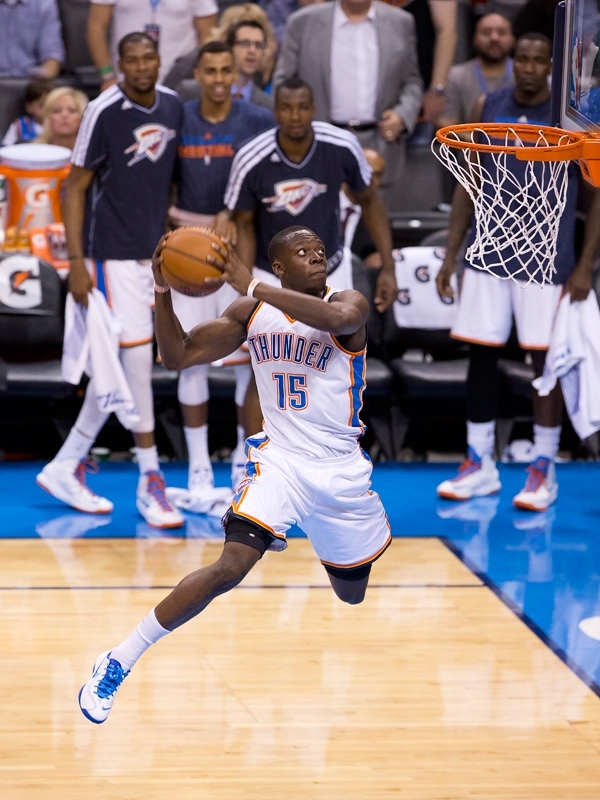 Reggie Jackson is learning how to make that transition. Even though he’s in his 3rd season, this is basically his 2nd season of playing. He was thrown into the fire his rookie season with Eric Maynor’s injury, but got sent back to the bench once the team signed Derek Fisher. In his 2nd season, he shuffled between the end of the bench and Tulsa for the first half of the season before finally being given the reins to the bench in the second half of last season. 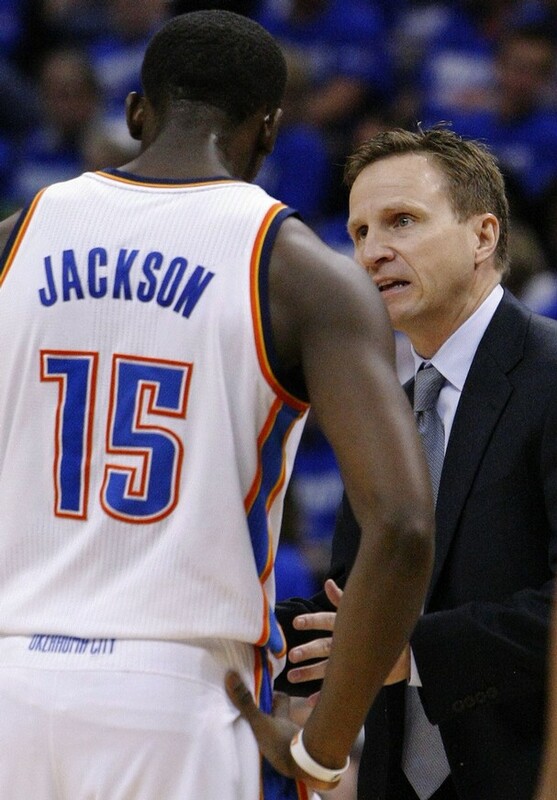 With the Westbrook injury, Jackson has had to commandeer the first team and has done a commendable job. Is he making mistakes? Yes. But he’s also showing signs of “getting it” and will be a valuable asset for the team moving forward. 2. 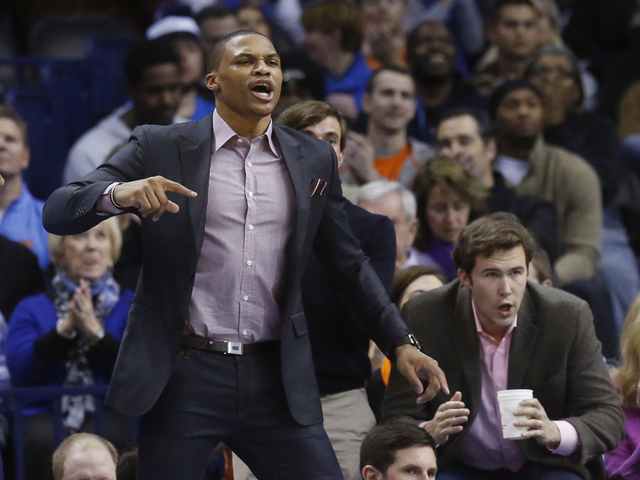 Russell Westbrook’s health is the single most important factor in the Thunder contending for a championship. That statement is self-explanatory. I don’t care what Russell Westbrook has to do to stay healthy for the remainder of the season. If he has to take every 3rd game off, let’s do it. If he has to be on the “Tim Duncan/Dwayne Wade” rest regiment, I’m down. Whatever it takes to get this man healthy and ready for the playoffs. Because if he misses any time in the playoffs, the chances of the Thunder advancing drops dramatically. The team is able to tread water during the regular season because there a ton of factors that don’t exist in the playoffs. The scouting reports are shorter for regular season games. The travel is more daunting during the regular season, which leads to fatigue. But during the playoffs, when a team has days to scout their opponent and there are no back to backs, this is where the team will need Westbrook. 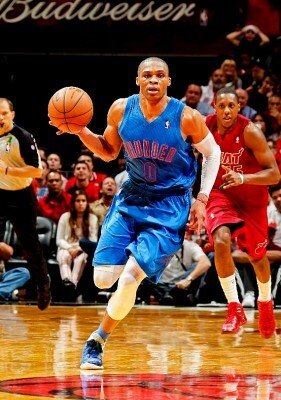 Get well Russ! 1. 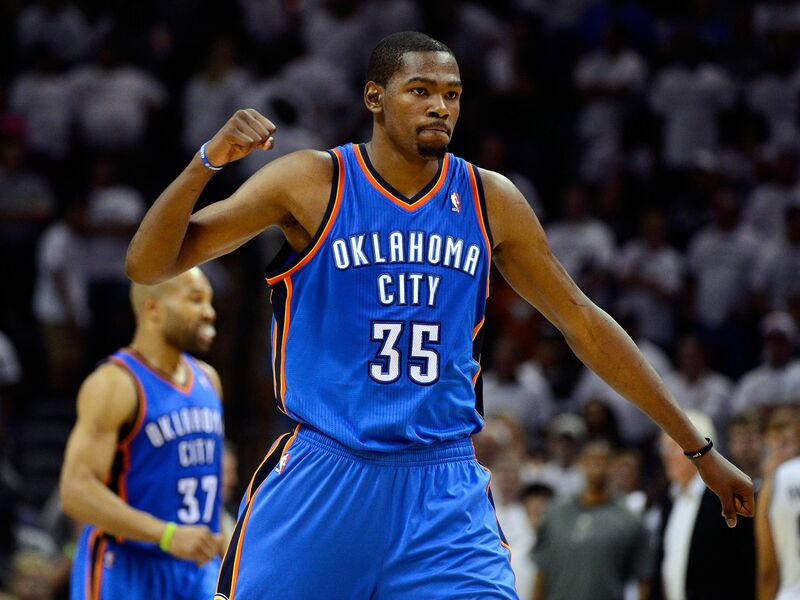 If it wasn’t for the championship resumè, Durant would be considered the best player in the game. It’s funny how the narrative in a 41-game stretch can completely change. When the season started, everyone was wondering whether Paul George would overtake Durant for the No.2 spot in the imaginary player ranking that many media members have. Then, when Lebron James came out the gates shooting over 60% from the field, the MVP award was basically handed to him by most media members. 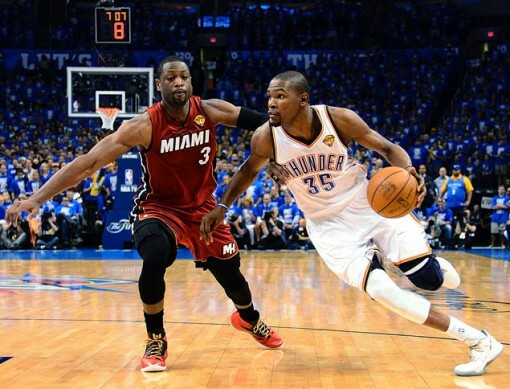 But Durant just kept plugging along, doing what he does. Efficient, ruthless, and calculated. Then when Westbrook went down again after Christmas, many thought the momentum that the Thunder had built up to that point would come crashing down. 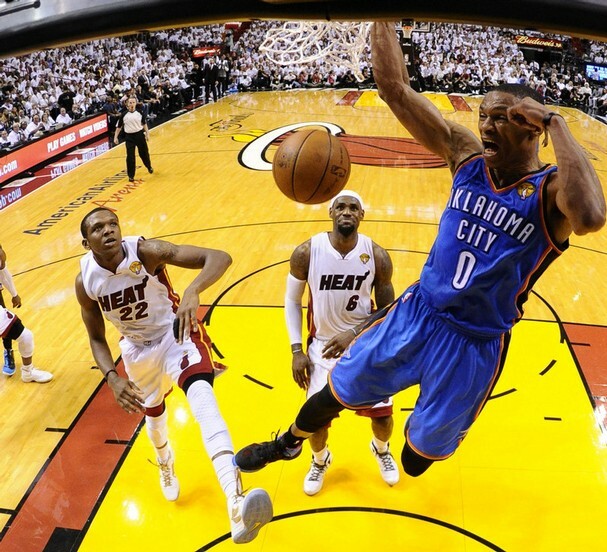 Rewind back to last season when Westbrook went down in the playoffs. Durant knew he needed to step up, and he did. But, I don’t think he trusted his teammates enough to allow them to do the heavy-lifting. Instead of focusing only on scoring, Durant instead became the de facto point guard, the best rebounder, and the best perimeter defender. In the end, that began to affect his stamina, and he found himself completely winded by the middle of the 4th quarter. This season, though, Durant has trusted his teammates more and the results have spoken for themselves. Ibaka has started to become an extremely reliable mid-range release valve, and a great partner in the pick and roll. The team is rebounding and defending as a whole better. The bench offers more roster flexibility. And the offense, while still stagnant at times, has enough wrinkles to quickly get out of funks. But in the end, it’s all about Durant. And his play in January (37 ppg, 5.6 rpg, 5.9 apg on 52/39/88 splits) has been one for the ages. 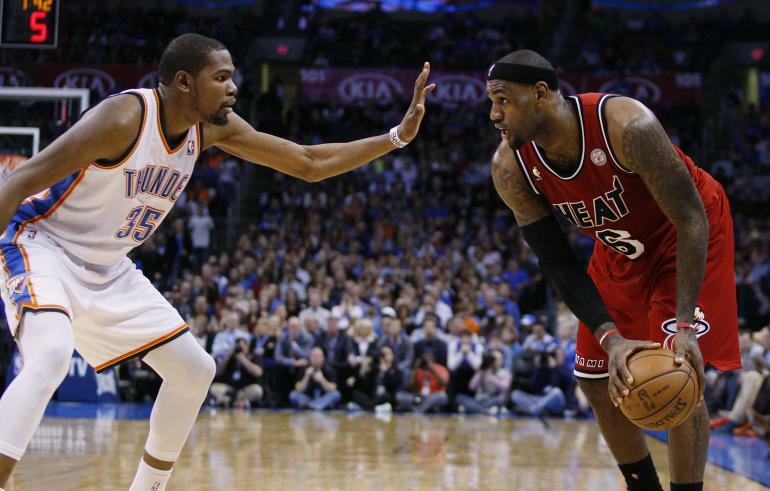 While MVP’s are not won in January, Durant is just now learning how to dominate, while not interfering in the game plan. He is doing this all within the flow of the game. It’s scary for the league when Durant is probably a season or two away from reaching his prime. There’s forty more games to go. 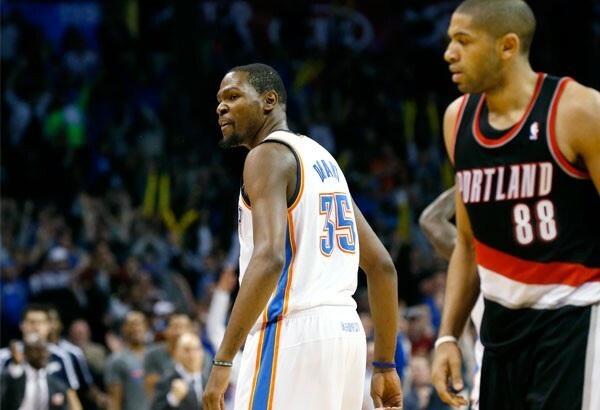 The Thunder defeated the Portland Trailblazers in raucous fashion to begin their next 41. The season is still a long ways from being over and many things can happen during that time. But, I, for one, am extremely impressed by what I’m witnessing from this team and what the future holds. Here’s to health and 16 more victories after the season.